When water is keeping you down, we want to help you get things dried out! We have a wide selection of water pumps from electric submersible to gas trash pumps to diesel dry prime pumps to our popular cable driven Flex Shaft pump! Do you have a sewer bypass project where you need some diesel compressor assist pumps or electric grinder pumps? We can help with that too! We also have a full line of 3-phase submersible dewatering pumps that we sell that are one of the top pumps in the industry. Need discharge or suction hoses? Strainers? We have all of that too. We want to help you on your next project. We offer portable single phase & three phase generators from some of the most popular manufacturers in the industry. Our Light Towers can help you light up your next project or use it to power a submersible pump all weekend without having to refuel. We offer both gas portable air compressors as well as towable diesel air compressors for your next project. If you have a driveway, sidewalk, or street that you need to install a utility but don’t want to open cut the street, we offer for rent or sale pneumatic piercing tools that can help you get your job completed. It seems with today’s infrastructure there are more and more utilities in the ground. It is more important than ever to make sure you can visually see the utility and verify the depth before crossing it or running parallel with it. We offer towable hydro-excavation potholers to help your crews be efficient and safe in the field. Pair it with one of our Utility Locators to help locate utilities and have the complete package. We offer (for sale only) a full line of products to help you install your utilities underground. Whether you want a directional pit launch model or are just looking for a moleing machine, we can offer a model that fits your needs. If you currently own a McLaughlin auger boring machine and need to order any replacement parts or need pricing for a new machine, we can also provide you with the right parts &/or equipment. If you currently own a unit and need service done on it, we can also help you with getting it serviced properly. No matter what your budget, we offer different locators that offer one or more frequencies to help you locate your utility. Pair your locator up with a Pipe Camera System, sonde, or traceable push rod to find exact location of what you are trying to find. We offer a full line of rigging equipment to help you complete your next project. We can custom build to your specification chain slings, wire rope slings, nylon slings, tow straps, round slings, pipe slings & more! If you don’t see a specific shackle, hook or lifting device you are looking for, please call us and we will try to find you a solution for your job. We offer different mat options for different needs. Call us or email us about your next project. We are the largest distributor for steel sheet pile in Iowa. Whether you are looking to rent sheet pile for temporary shoring or you have a project where you need to purchase sheet pile to leave in place, we can help you get the right sheeting to get your job done. Whether you are working on a DNR Crep Wetland project, DOT project that you need help with site specific engineering, riprap sheet pile, or need sheet pile for temporary shoring to support utilities or protection. Also available for rent is our Excavator Mounted Vibratory Sheet Pile Hammer (see spec sheet below). Dependant upon soil conditions, this unit will drive sheets up to approximately 20′ long. Call about other options available. Let us help with your next drainage project. We offer corrugated metal pipe (CMP) for culverts, underground detention/retention systems, water control structures, and other drainage applications. Culvert Pipe in stock from 12″ diameter up to 24″ diameter. We also stock connection bands and flared end sections. We can also help quote your next project as we are a dealer for two of the major manufacturers in the area. Whatever you are trying to cut through, we have the right equipment to help with your next project. We offer diamond blades, abrasive blades, cut-off saws, core bore rigs, diamond chain saws from all of the big name manufacturers. Let us help you saw up your next job in style. 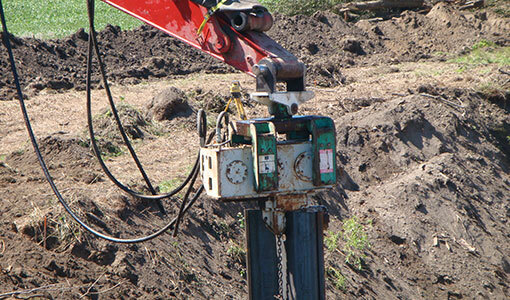 We offer a full line of Horizontal Directional Drilling (HDD) mud mixing products from Baroid. We also carry chinese fingers, swivels, carrot pullers, expandable pullers & can even order drill tooling for your drill rig. If you are looking to rent or purchase a jumping jack or walk behind compactor, we have you covered. We offer equipment from the top manufacturers including Wacker, Bomag, Multiquip, Atlas Copco, & more. We can even get you compaction equipment for your excavator. We offer traffic control equipment (for sale only) from one of the top manufacturers in the United States. If you are looking to buy any traffic control products, please let us know if we can help! If you are growing and constantly growing equipment to your fleet, we may have a product that can help you manage and maintain your equipment more efficiently. Our GPS asset trackers can be added to trucks, trailers, skid loaders, loaders, dozers, excavators, generators, pumps or other equipment. You can track equipment hours & set alerts when equipment reaches certain hours so you know when you need to service the equipment. There are month to month contracts, 1 year contracts, & 2 year contracts available. When you are trying to move snow, we have a snow pusher that will fit your needs. We offer the Snogremlin unit that has a rubber cutting edge to attach to your skid loader, backhoe, or payloader. Those of you that want a floating steel cutting edge (poly blade option available), we are a dealer for the Avalanche line of snow pushers. We offer hydrophilic & hydrophobic grouting products to help you stop the water when those other water stop products won’t do the trick. This grout is “in stock” & we can order you other products if we don’t have the exact product you need. We also stock fibrotite (oakum). If you are in the market for a new attachment for your skid loader or excavator, we can help! We offer a full line of attachments that include buckets, brooms, pallet forks, tree clearing equipment, thumbs for excavator bucket, sand buckets, tillers, rock wheels, pavement saws, toothbars, vibratory roller, augers, root grapples, & more. Call us and we would be happy to help! Pro-Tec Equipment’s dirt sifter is designed to serve as your main source for sifting backfill. With wire screens from 1″ to 4″ for sifting light backfill, to heavy-duty bar screens up to 6″ to filter out larger boulders, the dirt sifter can be used on the jobsite or in the yard.